BECKHOFF Automation offers a very fast solution for the coupling and decoupling of EtherCAT devices during operation with the EtherCAT coupler and EtherCAT junction with Fast Hot Connect. Hot Connect is an EtherCAT characteristic for changing topologies by direct coupling or decoupling during operation. With the new EK1101-0080 EtherCAT coupler and the EK1122-0080 EtherCAT junction with ‘Fast Hot Connect’, the connection time is reduced to 1 second to increase productivity. The Fast Connect Technology is used, for example, for fast tool changes on robots to shorten the cycle time and increase the output. Using Hot Connect, system components are coupled into and decoupled from the control system via EtherCAT by plug-and-play. The integration time is shortened to < 1 second with the Fast Hot Connect technology, which in the case of metalworking machines, results in extremely fast tool changes. The time required for the tool change is added 1:1 to the cycle time, therefore a shortening of the tool change time also results in a shortening of the cycle time and increase in output. The TwinCAT automation suite supports Fast Hot Connect on the master side. The EtherCAT terminal system is a modular I/O system consisting of electronic terminal blocks. 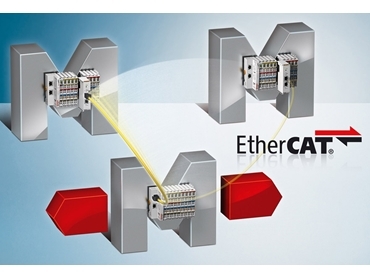 EtherCAT’s technological features are supported to the optimum, since the EtherCAT protocol is retained completely right down to the individual terminal. Suitable EtherCAT terminals are available for all common digital and analogue signal types encountered in the world of automation. Lower-level bus systems are integrated via local master/slave terminals.